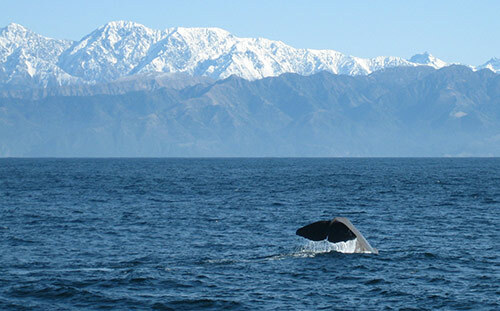 People often take for granted the fact there is an abundance of marine life in Kaikoura. Wildlife that is rarely seen in such close proximity to the land in other parts of the world. Ever wondered why Kaikoura is the location? If you ask someone who doesn’t know, they might say due to the warm water, or rich feeding opportunities. But the truth is, there is alot more to it than that! Sit back for a short geology lesson.. you are bound to learn a thing or two, and be amazed by the spectacular history and geological wonder that is Kaikoura. To understand why whales and other marine life are attracted to the Kaikoura region, we must first look at the geology of New Zealand as a whole as the Kaikoura phenomemon is the result of millions of years of geologic history of the region (and the world). This is a huge subject which goes well beyond the scope of asking why are there whales in Kaikoura, so I have attempted to condense this information into a form that best relates to Kaikoura and its marine life without fledging too far out into geological technicalities. You can read more in depth scientific accounts in papers like this one, if you are so inclined! The Earth’s crust is divided into a number of separate rigid sections called plates. These plates move in relation to one another at one of three types of plate boundaries: convergent, divergent, and transform. Earthquakes, volcanic activity, mountain-building, and oceanic trench formation occur along plate boundaries. Running thousands of kilometres up the middle of the ocean floor is a mid-ocean ridge – an irregular line along which new oceanic crust is being generated. Far to the east of New Zealand lies a mid-ocean ridge that extends for thousands of kilometres along the floor of the Pacific Ocean. New oceanic crust being generated at this spreading ridge constantly moves away on either side. East of the ridge the crust is travelling towards the coast of South America, where it plunges down into a subduction zone. Near Kaikoura is the end of a trough (the Hikurangi Trough) which is a subduction trench where oceanic crust of the Pacific plate meets continental crust which is being subducted beneath New Zealand’s North Island (causing volcanic activity). Just north of Kaikoura is the tail end of this trough. From this area and heading south, rather than the Pacific plate meeting continental crust, both plates are now made of continental crust meaning it is impossible for one area of crust to slide under the other as is happening in the North Island. Instead of subduction, the crust has split along numerous faults (the largest being the Alpine Fault) and the mountains are being pushed up (the Southern Alps etc). Closer to Kaikoura, the Hope fault is a small fault which splinters off the Alpine Fault as a twig would off a large branch. The Hope Fault marks the boundary between the Pacific and Australian plates and runs along the foot of the Kaikoura mountains. It is here that the movement between these plates changes from ocean floor subduction to continental collision (due to both colliding plates being continental crust). As a result, land uplifted along the faults form high mountains right at the Kaikoura coast (up to 2600 metres high just 12km from the sea), and close inshore (around 1 kilometre) the sea floor dives to depths of over 1000 metres. It is this deep water that has provided the environment to attract and sustain giant sperm whales and other whales and marine life that have put Kaikoura on the world map as a prime location to spot whales and dolphins. After feeding on giant squid in the deep canyon off Kaikoura, sperm whales surface and spout very close to land. The male sperm whales, particularly the younger ones, occupy the area all year round. Seasonal populations also occur. This is an area of high biological productivity that sustains large, diverse populations of marine mammals, fishes and invertebrates. This deep area, known as the Kaikoura Canyon, lies immediately offshore. The head of the canyon is just 1.6km off the mountainous Kaikoura coast, where the water depth plunges to 1000 metres. 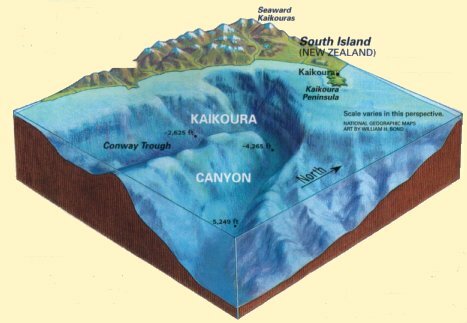 The canyon extends northeastward to join the Hikurangi Trough, which in turn connects with the abyssal Kermadec Trench, one of the deepest spots on earth (10,047 metres at it’s deepest point).